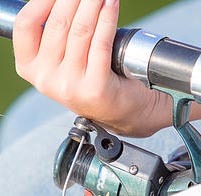 Since the 1970’s, the Martha’s Vineyard Rod & Gun Club has put on this eagerly awaited one-day Trout Fishing Tournament in May for the children of Martha’s Vineyard. The club purchases hundreds of trout and the volunteers stock Duarte’s Pond. After enjoying a delicious hot breakfast under the tent beside the pond, the kids are presented awards and prizes. Many of the club’s current members fished in this tournament as children. Now their kids are baiting the hooks.